As soon as you launch a website you understand that “build it and they will come” strategy doesn’t work. These days there are very few business domains and GEOs where you don’t need streamlined marketing processes to make it to the top. So if your competitors have already gone through their digital transformations and have established online presences, you will need quality weapons to give them a fair fight. And now let’s see what tools are essential to streamline each of those areas. Answer the public is an awesome free tool that will generate a ton of educational keywords in a matter of seconds. It compiles results from Google’s autocomplete in different variations and will definitely give you a clear understanding of what exactly your target audience is looking for. SE Ranking/Ahrefs/SEMrush – unfortunately, most of free tools lack custom data and exact metrics about the searchers which certainly help you make better decisions. So to level up your game you’ll need a quality toolset to find and analyse everything connected to content, keyword and backlinks. Ahrefs and SEMrush are the leading players in this field. They process immense amounts of data and will provide you with invaluable insights. BuzzStream – when you’re actively building links, especially if you’re not doing it alone, you need software where you can track, all the interactions between you and representatives of other websites, be in guest post requests, broken link building or competitor mentions scouting. Yoast – despite their recent scandalous bug (which is now fixed), Yoast stays one of the most popular freemium plugins that help you optimize your page according to the old-school SEO best practices. And if you’re just starting out with SEO, it may provide you with needed support and pointers to learn the basics. Page Speed Insights – the loading speed of a website is crucial for good user experience on your website. It mostly depends on your hosting provider, CMS engine, theme and number of scripts you run. But it’s still your responsibility to make your site load VERY quickly if you want to give Google the right signals. Mobile-Friendly Test – since Google switched to mobile first indexing, it’s more than reasonable to keep an eye on how your website performs on smartphones and tablets. Just checking how it looks on your own phone isn’t enough since Google has a ton of sophisticated criteria for evaluating mobile-friendliness of a page. So this tool by Google is a must-use. Hootsuite/Buffer – both toolsets are veterans of the social media management market and both have their own loyal customer bases. The main feature most wind up using is post scheduling. It really comes in handy when you have other things to do rather than login to Twitter to post something new every 3 hours. With scheduling constant worrying about social media turns into a couple hours a week when you put in all the needed posts. All that’s left is to login from time to time and interact with followers. BuzzSumo is another set of tools with a ton of features, but most commonly it’s used to look for topics in your niche that get most shares on social media as well as to locate influencers who can help you spread awareness. Mention – once you start growing, it’s good to keep track of all the people mentioning you/your competitors to interact and do damage control when needed. You can actually do that with Ahrefs Alerts as well if you decided to get an account, but Mention was created for this specific need. Followerwonk doesn’t look that fancy as it did before, but it still does it’s job. Which is to look for the most influential social media accounts in any business domain. And you will need this in your influencer marketing routine. Once a user landed on your site, you need to take action to convert them from a random visitor into a paying customer. To achieve that you need to collect contact details, engage and actively help. And there are plenty of ways to do just that with the following tools. HelpCrunch is a handy way to communicate with your website’s visitors and existing users. No matter what kind of product or service you’re providing, the new users often aren’t motivated enough to look for the details they are interested in themselves. That’s where a live chat can save the day. In addition to instantly building a personal connection with a user, you can learn a ton of data about them and stay in touch to convert them. And when they do convert, HelpCrunch can you go-to tool for communicating with your customers as well – through in-app messages, email campaigns, while also giving the best customer support experience. Sumo – another way to convert users is through various content upgrades, popups and sign up forms. Sumo’s toolsuite makes creating any of those elements on your website as easy as it gets. Stripo is a simple drag-and-drop email template builder for email marketers. It also offers a pure HTML code editor for skilled designers who are willing to create unique email styling. As they promise themselves, you can spend up to 60% less time on entire email creation process due to Stripo’s embedded micro tools and 300 ready-to-use responsive email templates. Not only does it allow to embed interactive elements into emails, but also offers built-in micro tools to design those elements right in the editor. For a new business, pay per click is often the best choice for quickly gaining the momentum and putting yourself on the map of the potential customers. Of course, SEO and SMM are great but to get them going websites often need a little push. Boosting posts on social media or promoting your educational or even product pages in search gets you results quickly. And if you did a good enough job with design and content, the new users may stick around, remember you and next time come to you by default without any additional investments. AdWords – Google created the biggest and most popular ad platform in the world. And you don’t even need to be a techy to use it on a basic level. Of course, to get quality clicks cheaper I strongly recommend at least going through the Google’s guide to Adwords. Bing Ads – even though far fewer people use Bing for search, their numbers are still staggering. If you work in one of Bing’s key markets, it might be a good idea to look into advertising there as well. Just as with AdWords, in order to save money you might want to start placing ads on educational keywords rather than the ones with buying intent. Facebook Ads/Linkedin Ads/Twitter Ads – once you know what social media your target audience prefers, test the waters and run a low-budget ad campaign to see if you can get users/leads at a good price. Grammarly is a writing assistant that uses top-of-the-line tech like machine learning to analyse your text on the go and give you helpful hints as to where you made mistakes. From experience, I can say that the tool got very smart and sometimes catches tricky errors which not any English teacher would see. Hemingway tackles a different issue. It’s an app that helps you proofread and lighten your copy. The tool uses color coding to show you which parts of your text might be hard to read and which words might have simpler alternatives. In an age where users are sick and tired of the corporate language, this one can be a lifesaver. And after a while you adjust your writing style and start to stick to the rules automatically. BlaBlaMeter – this one isn’t as sophisticated and frequently updated, but for a beginner blogger for whom the temptation to use corporate style is still high, this one can serve well. It’ll show you how much your text resembles the worst examples of the boring corporate documents. If you don’t analyse the traffic you’re getting from all of your promotional sources, you can’t make informed decisions as to what’s working and what you should be concentrating on. The tools below will make sure that doesn’t happen. 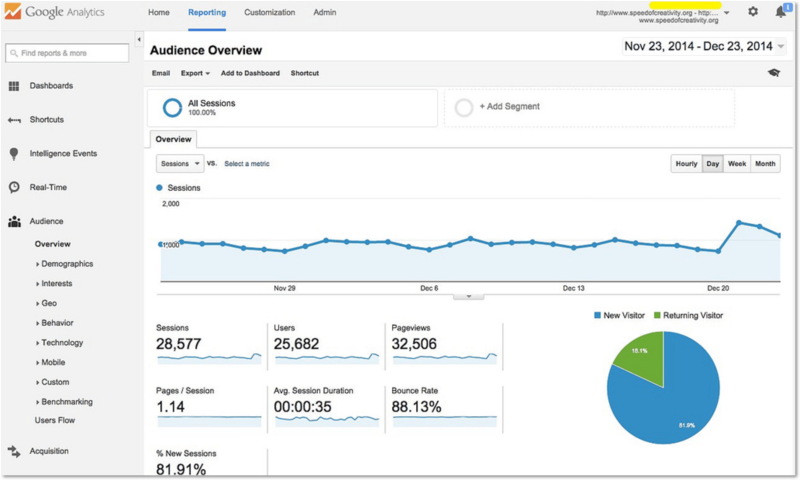 Google Analytics – even though you can get paid software like KissMetrics to analyze traffic on your site, Google Analytics stays the go-to tool for marketers worldwide. Google Tag Manager – a tool that helps you get a lot more insights from your Google Analytics. Before Tag Manager, you’d need a software developer to manage all the pixels and events that happen on your website but now you have a pretty straightforward interface for that. UTM link builder – to be able to see, what sources exactly send traffic your way, you need to have custom UTM links that communicate with your GA. So each time you place a link to your site in a guest post, on social media or in a newsletter, make sure it has the UTM codes. URL shortener – once your links are enhanced with UTM codes, they look pretty ugly. That’s why you need to make them short and sweet. Canva – a simple, freemium and incredibly intuitive tool for creating visuals for landings, social media and blog posts. A lifesaver for a marketer who’s had enough of boring stock photos. OptinMonster is a tool that helps you convert your website visitors into subscribers. It lets you do A/B tests to find the optimal message for your target audience and generally makes it easier to generate more leads. Trello – a very easy management software that will help you keep track of all the tasks and progress you and your team make. Jira – if Trello is too simple for you, you can go for a Jira plan and create custom and complex Agile workflows. But if you’re just managing a copywriter and a marketer, that might be an overkill. Even though that was quite a list, try not to feel overwhelmed. In reality, all these tools are incredibly intuitive and easy to learn. All you need to do now is put together an online marketing plan and start small. In a couple of months when you’ve tested all these tools you’ll know, which you need more and which you can put on hold for the time being. Let me know in comments if I missed anything! What are your favorite online marketing tools?